Just Taylor: Spring 2014 Fashion wishlist! Hi guys! In the past week or so when I've passed through a handful of my favourite fashion stores and browsing the internet, I've came across a few items that I think will be perfect for Spring. As I'm fully aware that it is not yet Spring and we still have to wait a bit, I know that there will be a lot more pieces when the full season collections make an appearance. However, for now I thought I would show you all what is on my wishlist! I think that pastel colours and vibrant corals and oranges are great for spring and even summer, and can work for most skin tones which is always a bonus. 1. Bright pink graphic skirt - River Island £20. 2. Navy colour block bowler bag - River Island, £40. 3. Lilly long sleeved swing playsuit in Floral Print - Boohoo.com, £12. 4. Yellow daisy short statement necklace - River Island, £12. 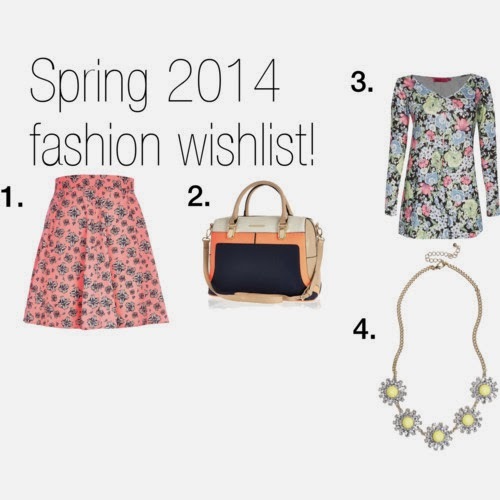 What is your Spring 2014 fashion wishlist?